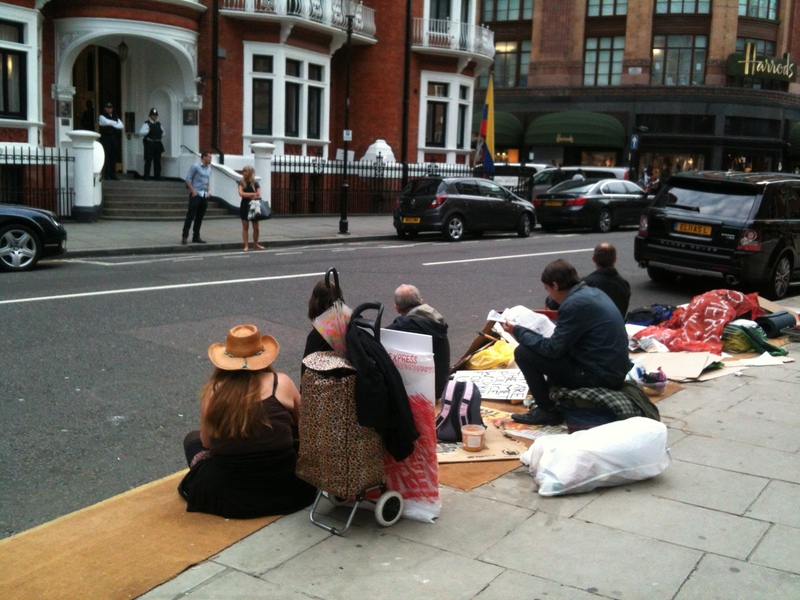 Since 16th August a committed group of activists from Occupy, Anonymous and other individuals have been maintaining a continual presence opposite the Ecuadorian embassy, enhancing and invigorating the existing daily vigil undertaken by people from the WISE Up network and others. Those sleeping out have endured harsh weather, lack of shelter and, increasingly, the attentions of the police, who seemed intent on disturbing and breaking the vigil. On Wednesday 29th August, police acted to remove the temporary crush barriers which had initially marked out a press pen and thereafter been established as a vigil space. See also this previous post. In so doing, not only were many of the banners and signs supporting Julian, Bradley and Wikileaks taken away, but the shelter and safety created by the vigil space was also removed. Additionally, those present in the evening of 29th were threatened with arrest and with the removal of their personal belongings, under the notion that they were creating an obstruction to the highway. Despite significant intimidation, those on vigil stood their ground and remained overnight. 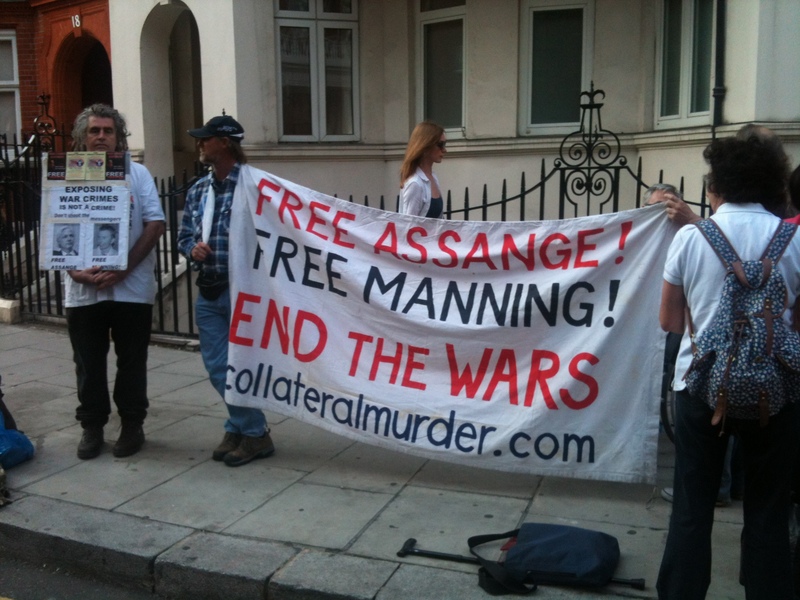 On Thursday 30th August, Ben Griffin of Veterans for Peace UK again met Julian Assange. 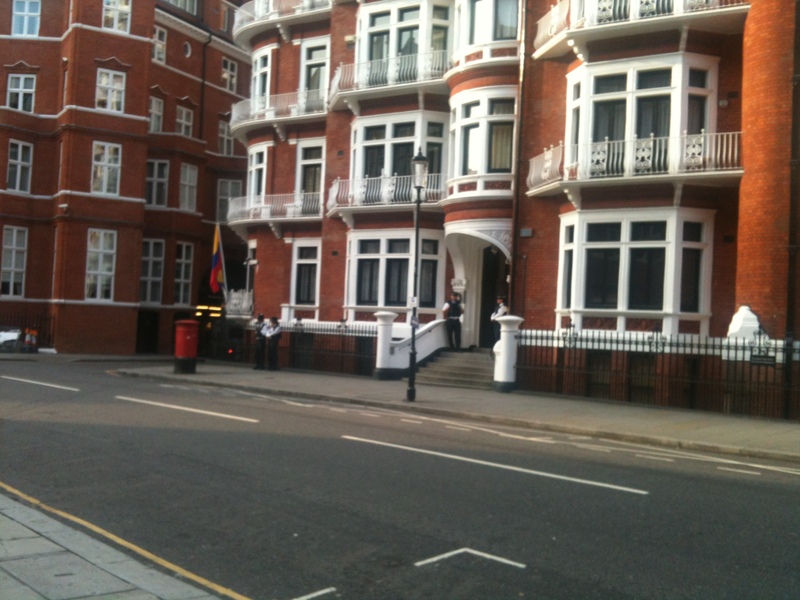 Ben received reassurance from Julian as to his security within the embassy and Julian expressed concern for the welfare of those who had been outside for the previous 13 days. It was concluded that a constant 24/7 presence was therefore unnecessary and Ben passed this information on to those outside on Thursday afternoon. The Occupy and Anonymous protestors decided to complete their continuous vigil on Sunday 2nd September and made this intention clear to police on the ground. Solidarity in the group was such that they sought to leave together at a time and in the manner of their own choosing. However, that same night the police again moved in on those sleeping, making similar threats of arrest and removal of personal items and equipment – without success. During the day on Saturday 1st September, the group packed and assembled their gear and moved off from the site, as intended, on Sunday morning. A daily vigil continues at the site, with people coming down as and when they can and for as long as they can manage. This evening, two members of the 24/7 group returned to site for a few hours and were warmly welcomed. 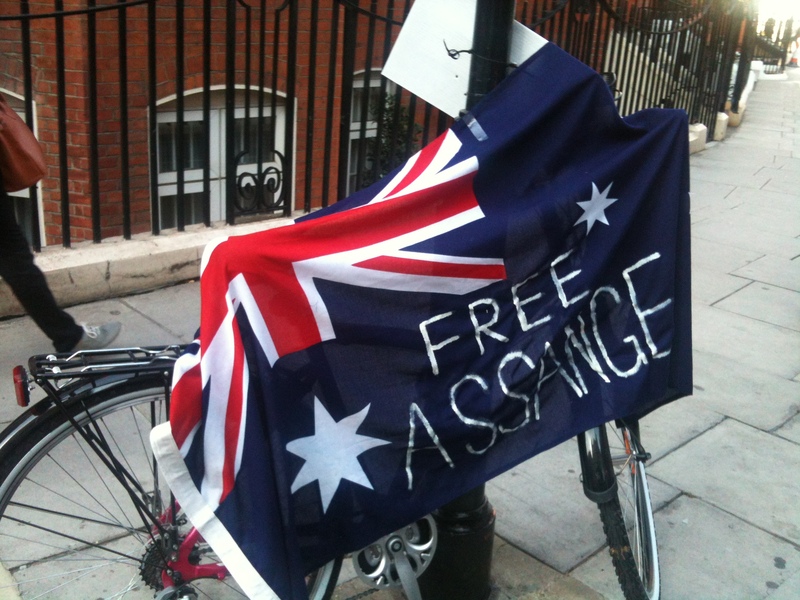 Gallery | This entry was posted in Assange, Reports and tagged Anonymous, anti-militarism, anti-war, Australia, Britain, Ecuadorian Embassy, extradition, Julian Assange, London, Occupy!, solidarity, vigil, WikiLeaks, WISE Up. Bookmark the permalink.